We decided to give it a try tonight as a pairing with chicken cordon bleu. Generally we make Parmesan roasted asparagus to go with it but the fresh asparagus in our area hasn’t looked too hot lately and this recipe called for frozen, so it was a good fit. In a bowl, mix together frozen asparagus, water chestnuts, cheese, soup and half the onions. Pour mixture into a lightly greased 8x8 casserole or baking dish. Bake, uncovered, for 25 minutes. Sprinkle with remaining half can of onions; bake for an additional 5 minutes. We did change it up just a bit by omitting the peas and reducing the amount of water chestnuts a bit. You could certainly make other changes based on your preferences! It’s a very rich, filling casserole. I would have liked to see the cheese melt through more, so next time I will try grating the cheese instead of cubing it. The original recipe does call for a full can of the water chestnuts but I’m glad we halved it. A full can would have been a little much for me but if you really love them you could certainly do the full amount. Don’t forget to pick up a copy of Gooseberry Patch Quick & Easy Christmas to try other recipes like this one! Do you add anything different to your asparagus casserole? I'm not much of an asparagus person, but this sounds really good!! Thanks for linking up to Recipe of the Week! Heather, I never was much for asparagus, either, until a couple of years ago. Now we have it at least twice a month (usually roasted with Parmesan cheese). And you're welcome, thanks for hosting! We love asparagus! I like new ways of using veggies. Thanks for sharing! 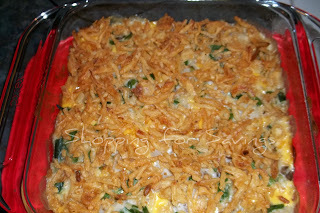 this looks much like my mom's green bean casserole, but i think i might like this much better with asparagus. thanks for linking up! I found you from a Dishing It Up linky on TTP. I'm not sure my wife would like this, but I think I'll have to try it myself!